One way that communities can help create environments that promote health is to include health in their comprehensive plans. Comprehensive plans guide development in cities, villages, and towns. There are many different ways to plan for health, and the strategies differ for urban/suburban and rural areas. We have created a tool to help planners in rural areas incorporate health into their comprehensive plans. The latest version of the tool is now available for download. Click here to download the tool. Interested in hearing about new versions of the tool? Click here to sign up for e-mail updates. Your feedback on the tool will help us improve future versions, so please consider filling out a short survey about how to make the tool easier to use and more helpful for your work. Click here to access the survey. For urban and suburban areas, we recommend using the Healthy Living and Active Design Scorecard, developed by Cedar Creek Planners and Nemours. 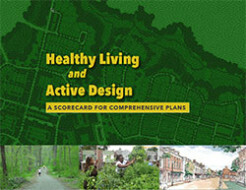 Visit http://www.cedarcreekplanners.com/scorecard-for-healthy-living/ to learn more and download the tool.